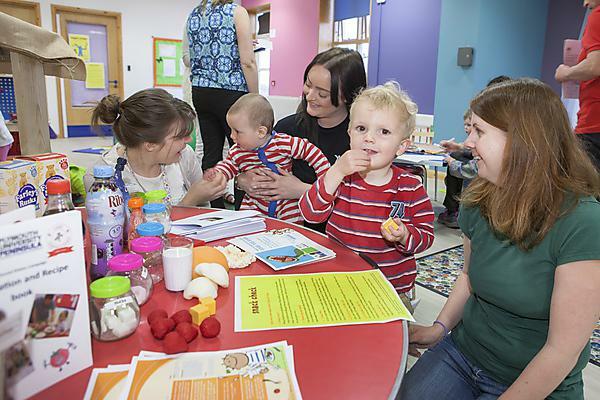 A project run by medical students at Plymouth University Peninsula Schools of Medicine and Dentistry with the Green Ark Children’s Centre in Devonport, Plymouth, has helped parents and children towards a healthier diet. Three groups of third year medical students carried out the project. In their research, the first group found that less than a quarter of adults in Devonport eat healthily, which in turn has an impact on what children in the area eat. The students created a points-based quiz for parents attending Green Ark Children’s Centre to assess their understanding of the nutritional value of food they eat on a regular basis. The quiz revealed that half of children have healthy food at home. It also showed that parents were confused about which foods were healthy and which not, especially around ready-prepared meals and ketchup. As a consequence, parents were interested in the ‘Eat Well Plate’ and how they could use it to improve the healthiness of everyday meals. Using the findings of the first group, the second focused on the importance of a healthy breakfast to children’s development and held a stall at the Green Ark Children’s Centre’s Friday Stay and Play session. The stall included examples of healthy breakfast options that do not take a lot of time to prepare, together with information posters and leaflets explaining healthy foods and portion sizes for toddlers and props demonstrating the sugar content in food. The students talked to parents about healthy breakfasts and found that nearly all the children at Stay and Play eat breakfast every day and that their parents understood what a healthy breakfast consists of and that they fed their children well. The students also gained a better understanding of the challenges that parents face when they feed their children. The third group used the second group’s session to shift the focus to healthy snacks and limiting snacking to twice a day. They used information from Change4Life and NHS Choices, as well as props, to engage with parents and their children. They also developed a poster to reinforce messages about sugar intake for children. The feedback from parents was largely positive. The project is part of the new social engagement programme which sees third year medical students undertake a number of projects in partnership with community organisations designed to raise health awareness and to improve their understanding of social responsibility. The programme is delivered by the Community Engagement Team at the Peninsula Dental Social Enterprise.